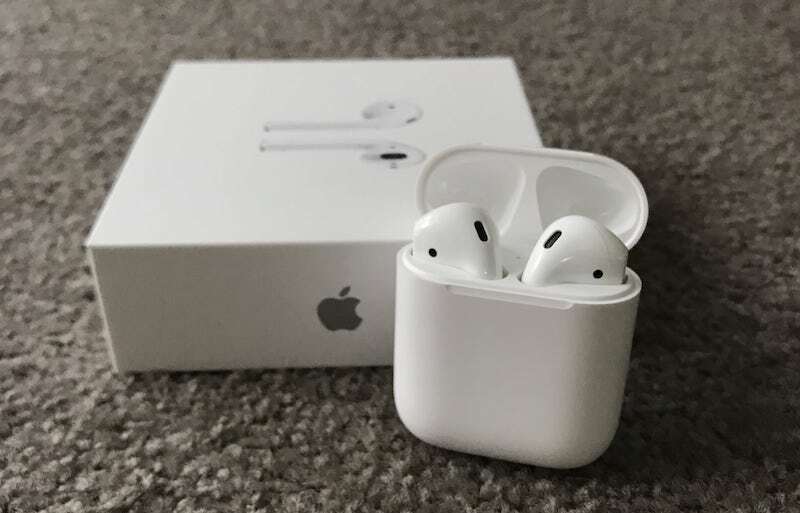 A report last week by Slice Intelligence suggested that Apple's AirPods captured an estimated 26 percent share of online revenue in the wireless headphone market since launching on December 13. Ben Arnold, an executive director and industry analyst at NPD Group, has today submitted a report that claims Slice Intelligence's data "paints an incomplete picture of the wireless headphone market" (via CNET). According to NPD's numbers, for all of December Apple captured a 2 percent share of the market in unit sales, and a 3 percent share in overall dollar sales. The discrepancy between the two sets of data lies in the methodology used by each site to gather the information. Slice Intelligence analyzes the email receipts from a panel of 4.2 million online shoppers, while NPD's data accounts for both online sales as well as brick-and-mortar transactions. It should also be noted that NPD tracked sales for all of December, while Slice Intelligence accounted only for the period when the AirPods were on sale, December 13-31. Arnold noted that Apple's AirPods launch is still "significant," despite the lower numbers presented by the NPD, and given how little time the AirPods have been on the market. The analyst also said that in a year where the Bluetooth headphone market grew 51 percent from the previous year, "the fact that Beats was able to maintain share and its position in the market means its sales grew as fast as the market did." "Apple being able to capture 2 percent of the market in units and 3 percent in dollars with one product in its debut month is significant, given how big the headphone market is," Arnold said. The AirPods have been mostly well-received by users since their December launch, although some have faced consistent battery issues with the device and its charging case. Apple hasn't released sales figures of its own, but CEO Tim Cook called the AirPods "a runaway success" when asked about the first few weeks of the headphones' launch in late December. They might have captured more of the market if you could actually, you know... buy them. Apple needs to fix their supply chain. People will walk into the Apple Store and ask "Hey, I want to buy those new AirPods" and get told "We don't have any in stock. They're not available until March." Will they wait? No. They will buy something that IS in stock, or go elsewhere. Product needs to be readily available. So does this include online and B&M sales from Apple? It's just another reason all this data is worthless. None of these outfits really know they're just guessing and extrapolating. And then people run with whatever numbers fit their agenda. I don't understand the problem. The old EarPods look almost exactly the same. But they also have a white cord that hangs down from both sides of your face... across your body... and into a pocket. Are telling me that cords hanging from your head and body looks better? I bought a pair of AirPods and loved them, except they didn't fit my ears. The one size only thing really killed it for me. I loved the tiny case and everything. So bummed they didn't work out for me. I had to send them back. Yep. Earbuds are not a one-size-fits-all (or even one-size-fits-most) product. I'm not sure why Apple wants to continue to pretend that they are. Our unsubstantiated data is more accurate than their unsubstantiated data! It should also be noted that NPD tracked sales for all of December, while Slice Intelligence accounted only for the period when the AirPods were on sale, December 13-31. Key point here. You know what? I bet if you included sales for ALL of 2016, Apple's share would be EVEN LOWER! Gasp! And yet how often do we see people say this is just marketing 101 and all intentional on Apple's part to make something appear more in demand than it really is. The old EarPods do not look like limp cigarettes hanging out of one's ears. Houston (Cupertino), we have a problem.. Unfortunately, this photoshop is wrong (intentionally or unintentionally). Since when is the "thickness of a cigarette" the barometer for whether something looks goofy or not? But seriously... the AirPods have probably the lowest-profile of any wireless earbuds. Yes they have a stem... but they're still pretty slim overall. They can fit under hats, helmets, etc. And the stem actually has a purpose... two beamforming microphones that are aimed at your mouth. It's a great idea. Sadly... people forget that little nugget of information.